A series of protests against a mosque in Bendigo and the launch of an Islamophobic party in Perth may be cause for concern — but only if political leaders fail to invalidate fringe views. Again. It used to be the case that the sentiments against Muslims were so inchoate, and the people involved so disorganised, prone to infighting and uncommitted, that they were hard to take seriously. Most 'rallies' in various Australian cities over the years drew laughably insignificant numbers, with themes so absurd that they could only be dismissed. 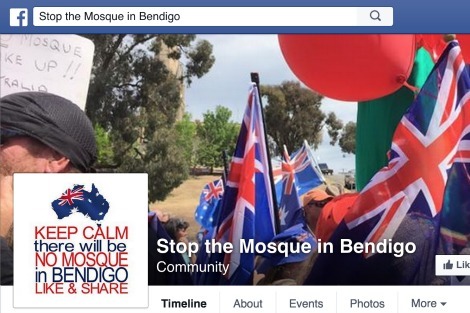 However, since June 2014 when Bendigo resident Julie Hoskin challenged council approval for the Australian Islamic Mission to build a mosque for 300 or so Muslims in the area, protests have escalated. Far-right groups, all based outside Bendigo and usually at odds, have appeared on the scene. Rallies in July, August and October this year have cost taxpayers nearly a million dollars to police. Many locals, who had assumed that the issue would eventually fade, are appalled that their picturesque town has become the setting for organised bigotry. Such things, however, don't incubate in a vacuum. Generalised hostility against Islam is part of a continuum tracing back to 9/11. In Australia it is also sourced from a deep seam of xenophobia and racism. Recent atrocities in the Middle East, the Lindt café hostage crisis last year, police raids and arrests of suspected terrorists all contribute to a narrative of being under siege. The counterpoints should be easy to make. First, Islam is not a monolith; it operates within different geopolitical and cultural milieus, like all religions. Second, based on statistics alone, the smart assumption is that Muslim Australians are rather ordinary and need not explain themselves. Third, the social upheaval that they are accused of causing is actually being enacted by those who hate them. Fourth, our democratic systems and institutions are not so brittle that they must be defended against 'creeping sharia'. The irony here is that those who extol the virtues of Australian culture understand nothing of its fortitude. Abbott found every opportunity to drop the phrase 'death cult'. It is a phrase echoed in submissions to a senate committee inquiry into 'third party certification', which was set up under a moral panic over halal labels on Vegemite and other food products. Senators Cory Bernardi and Jacquie Lambie continue to insist that halal certification funds terrorism, despite evidence from the Australian Crime Commission and Australian Transaction Reports and Analysis Centre (AUSTRAC) that the link does not exist. With their anxieties validated, it is no wonder that anti-Islam groups are energised — to the extent of launching a political party this week. The Australian Liberty Alliance (ALA) seeks to emulate Dutch politician Geert Wilders' Party For Freedom, with policies like banning full face coverings in public and removing Australia from the UN charter of refugees. Its senatorial line-up includes Q Society's Debbie Robinson, anti-halal campaigner Kirralie Smith, and outspoken former army officer Bernard Gaynor, who had lodged a submission to the Bendigo council against the mosque on the grounds that 'every time a mosque is built in Australia a little bit of this nation dies and is replaced by the Middle East'. Pronouncements like this may be freely made, of course, no matter how much Islamophobes portray themselves as victims of political correctness. Corrections regarding racial vilification and incitement are more properly determined in the court, so it is not groups of people like Muslims, lefties or moderates who are oppressing them but the laws that operate in the secular democracy they purport to defend. Still, it is not unreasonable to be concerned that a new political party, along with some degree of collaboration between far-right groups around local issues, might normalise the sort of views that find expression in abuse and violence against Muslim Australians, and conceivably extend to other minorities. Muslim Australians, in the end, will have to have more faith than their detractors in the robustness of systems that ensure the safety and flourishing of all citizens. The question is whether those in power will add to that robustness or subtract from it. New born babies seem to imagine THEIRS are the only concerns that matter. They are unable to cope with wider considerations until maturity enables them to handle more. Many Followers of most religions seem to suffer from the same immaturity. They are born into ONE interpretation of the pathway up God’s Mountain, and assume it is the ONLY such path. But God calls everyone via a personalised path, tailored to their degree of development and the culture of THEIR Traditions, however tangled and twisted those traditions may be. Only when this is recognised and respected by ALL will there be Peace and Harmony between ALL God’s children. I really appreciate your articles Fatima. Many thanks for the work your put into them. The rise of these right-wing anti-something parties illustrates a fundamental Australian mind-set: fear. I've just finished Alan Renouf's "A Frightened Country" and have copies of David Walker's "Anxious Nation" and David Marr's "Panic". We've been scared stiff of someone else taking over uninvited ever since we took over uninvited. Mustafa Kemal the revered Father of Modern Turkey was determined to create a secular state devoid of any connection whatsoever with militant Fundamentalist Islam. If memory serves me well,he banned the wearing of any face covering in public buildings. He also intensely disliked religious fundamentalist rabble rousing and publically hanged those clerics in rural areas who persisted in the practice. The Turkish Armed Services guaranteed the secular Turkish State and continue to do so. Kemal Ataturk,as he later became,wanted his country to be part of the 'West'. Europe as a whole has encouraged Turkish 'Guest Workers'for decades and benefited hugely economically as a result. What a pity Turkey has so far been excluded from membership of the EU; what an effective partner they COULD have been in our current predicament. We in the West have a responsibly to clear up our own backyard. I am appalled by the behaviour of some of those 'dyed in the wool ' anti-Islamist radicals who persist on spreading their hateful bigoted views in an already heated and poisonous atmosphere. What attention (if any) is being taken of those Fundamentalist elements within Judaism and Christianity who also encourage rigid stereotyping of 'The Other'. Thank you Fatima for your article. I'm glad we live in a society where there is a reasonable freedom of speech. You express your opinion and others (right wing) expressed theirs. You managed to list all the public spokespeople against Islam and so what is your intention? To identify who they are? These people have their own reasons to fear the rise of Islam world wise. It's enough to look at Europe to see what happens there. People are afraid to walk out. Second generation Muslims don't have a sense of belonging to the Western world, so they seem to express their dissatisfaction by harming others. And who is to blame? Blame them for defaming Islam and not the people who speak their mind up against Islam. We all should have the right to defend our safety and values without fearing that someone will call us bigots. Well Jay, I suppose I'm more comfortable with Fatima naming specific individuals then your referencing of whole groups on the basis of their religion. Fatima's approach at least limits the field and allows those individuals to dispute her opinion if they wish whereas your generalisations like 'second generation Muslims' is so vague and general that it wouldn't matter how many of that group that could be shown to 'have a sense of belonging' you would still argue that they are merely exceptions to your blanket condemnation. As for protecting your safety, we have a greater chance of being killed by someone in our own family or circle of friends than have of being killed by a muslim assassin. Have you ever totalled up the number of people killed in the US in the last decade by gun-toting white Christian Americans compared with the number killed by Muslims? And as for protecting your values, I'm finding it difficult to think of which our particular values might be at risk from 'second generation muslims'.